"Prospect Park is a dog's paradise, with wide-open spaces to roam. 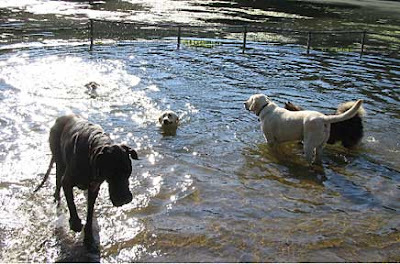 Now they have made the Park even more dog-friendly by creating the Long Meadow Dog Beach at the Pools. A one of a kind creation located off 9th Street on the path leading down from the Tennis House. " OK, lets relax, its 100% adorable but its basically just a roped off section of the pond for dogs only. Which rules! don't get me wrong. There is a fence to keep the dogs in so you don't have to chase them across the pond.